I've been away from blogging a bit but will return shortly with some updates on the Rocks and Fossils class I taught this past week. In the mean time, I thought I would post this photo I took in Norway back in September of 2006. While I was there I shot some photos and I'd forgotten about this one. 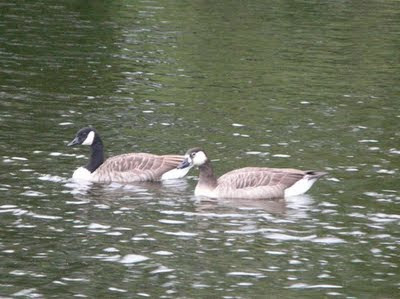 That is clearly a Canada Goose on the left but the bird swimming with it on the right sure looked strange. The body seemed pretty normal but there are a number of strange plumage issues. First off, the neck is brown rather than black and it fades out at the bottom instead of having a sharp line. The white stirrup on the head is likewise wider than normal. It starts to extend down the neck and has a poorly defined edge. There is also a white ring around the base of the bill and it has a white eye ring. What was up with this bird? As the title of the post suggests, I recently figured out what the issue was with this bird. I had my suspicions since this bird was also hanging out with a pair of Graylag Geese. I did some research on line to confirm the cross but this is indeed a Canada Goose X Graylag Goose hybrid. I found several similar examples online. Pretty interesting. Interesting - I wasn't familiar with the graylag goose before. I was wondering earlier this summer about a possible hybrid duck I was seeing here in Northfield, hanging about with some young mallards. Hello Penelope. Thanks for stopping by. That sure is an interesting duck! Hopefully it will stick around for a while so you can see if it changes.